Anda: I had precisely two hours today —30. November— between a hair appointment and Kita pick-up, and now I was staring blankly in a mild panic at the cheap plastic trinket aisle of the toy store. A women standing next to me remarked, Adventskalender stress! (in Germany this is the busy time before December) and we both cracked up. However, on 30. November, we are still staring dumbly at the plastic trinket aisle and trying to throw together an advent calendar by the end of the day. Everyone walking home from work is carrying a bundle of festive greenery. Suddenly there are Gluhwein stands outside of the cafes. It’s like Berlin flipped a big switch labelled CHRISTMAS and everything immediately lit up with fairy lights. So. 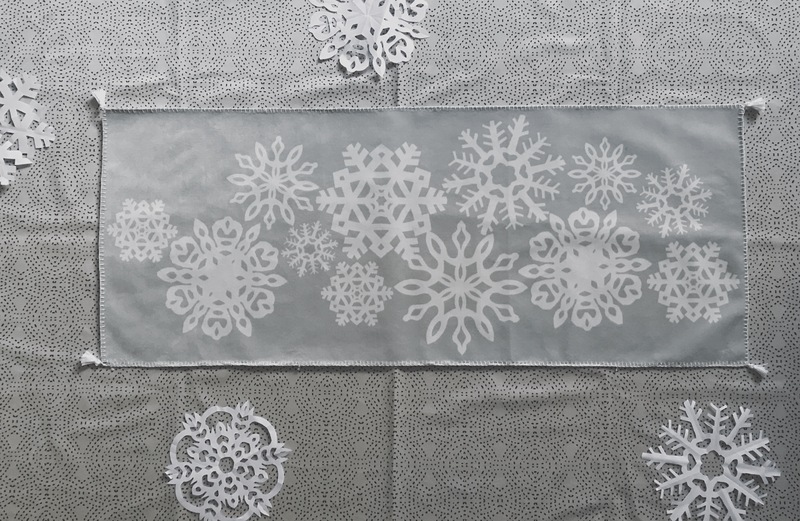 Because we all need something low-stress, this is a crazy easy DIY to make a festive table runner this holiday season using the simplest of holiday decorations: paper snowflakes. The sewing part takes no thought at all (I recommend catching up on a podcast or two) and the fabric design bit is a cinch. 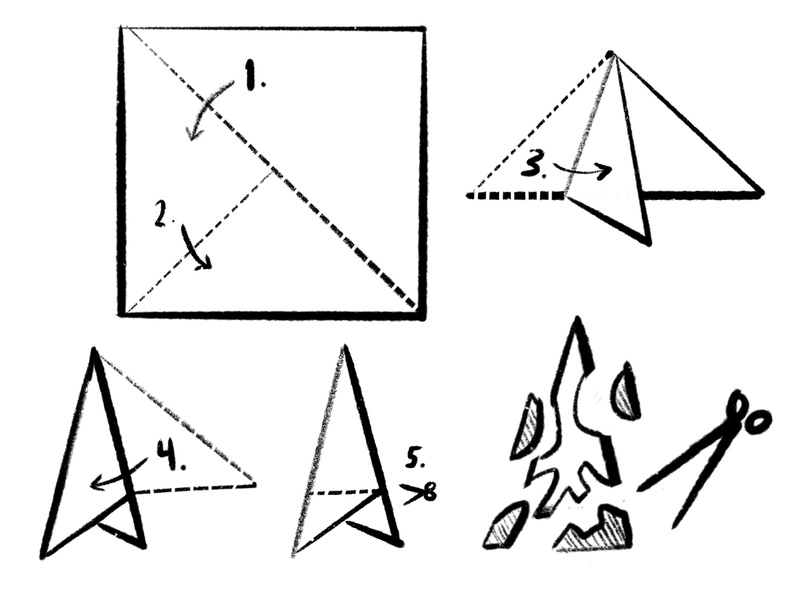 To cut a really nice paper snowflake, start by folding it properly. Take a sheet of A4 or letter-sized paper and cut it into a square. Then…well, I’ve made a little drawing showing the next steps below. Once it’s folded up, cut little bits off the sides (there are many templates on Pinterest if you need ideas), then unfold and be amazed. 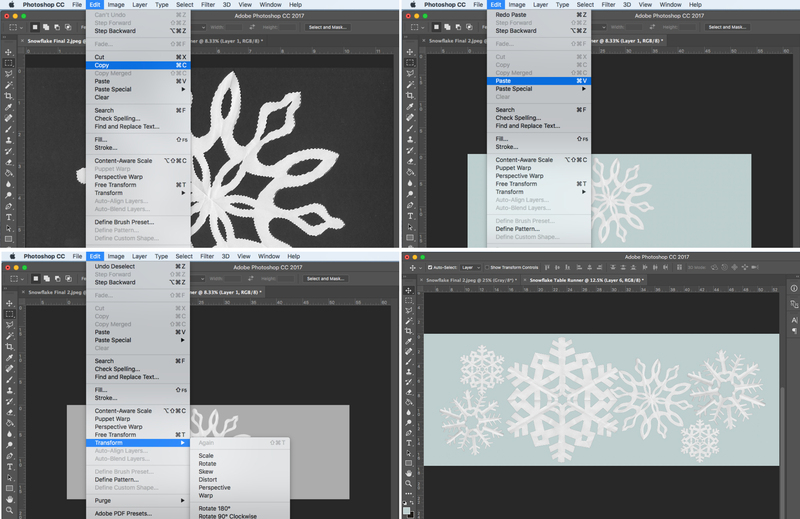 After you’ve made a bunch of paper snowflakes, set up a new file in Photoshop that is 18″ high and the width of fabric you will be ordering. I really wanted to try this in Celosia Velvet, so I made mine 54″ wide. For your Spoonflower projects, make sure you work in the RGB colorspace and your file is set at 150dpi. 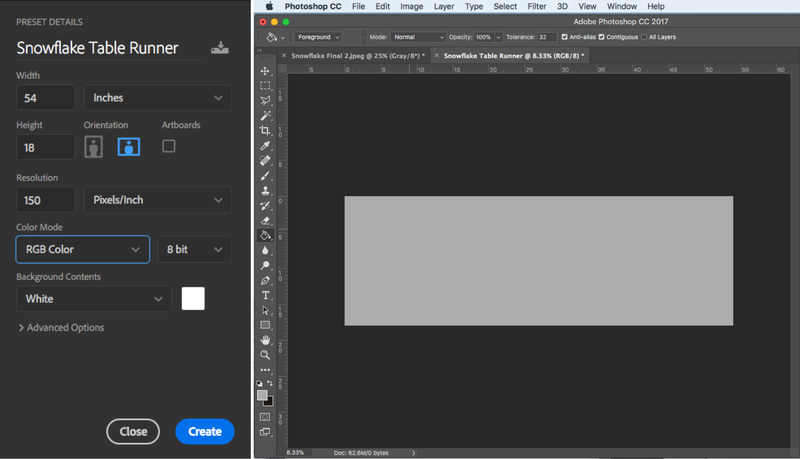 After setting up your file, choose a background color for the runner with the color picker tool, and then use the paint bucket to fill the entire background. 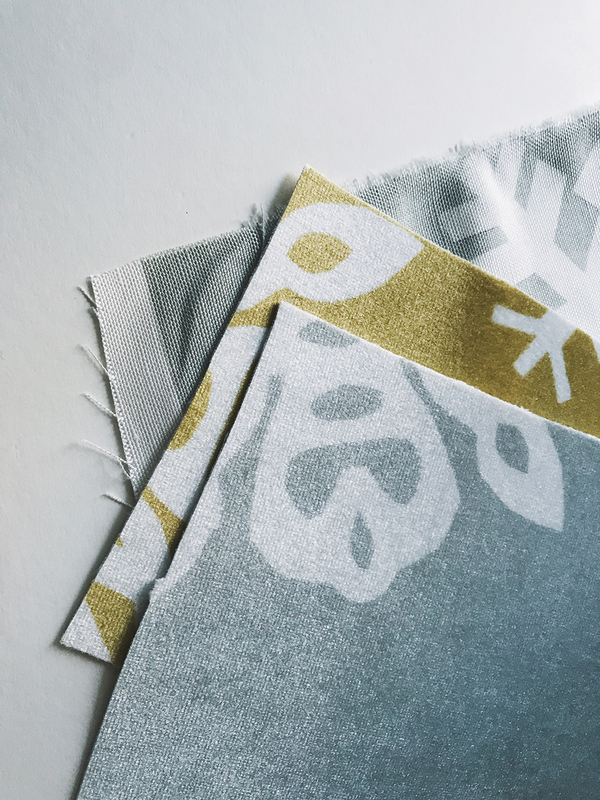 My favorite thing about Celosia Velvet is that grey, pale yellow and light brown tones come out looking like gorgeous metallics. It’s the holidays and I wanted to make something shimmery, so I ordered test swatches in what I thought would be gold and silver. Success! Below, the top two are velvet and the bottom swatch is linen-cotton canvas. The Celosia Velvet prints colors like yellow and grey with a shine! Take one snowflake and lay it facedown on your scanner then place a black sheet of paper overtop of it. 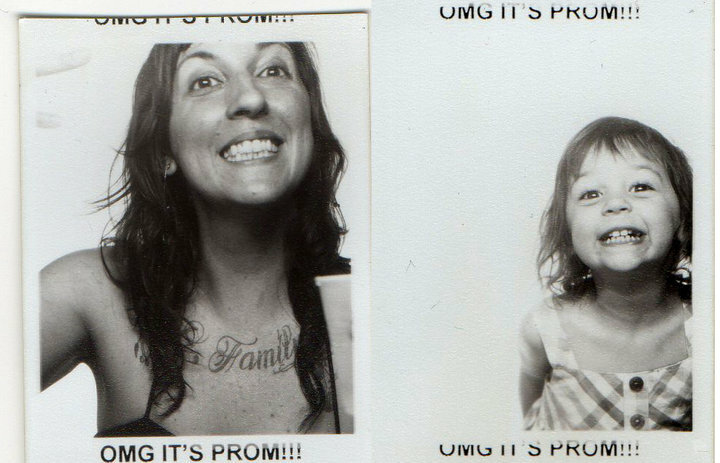 Scan in black & white at 300 dpi. Repeat with all of your paper snowflakes. 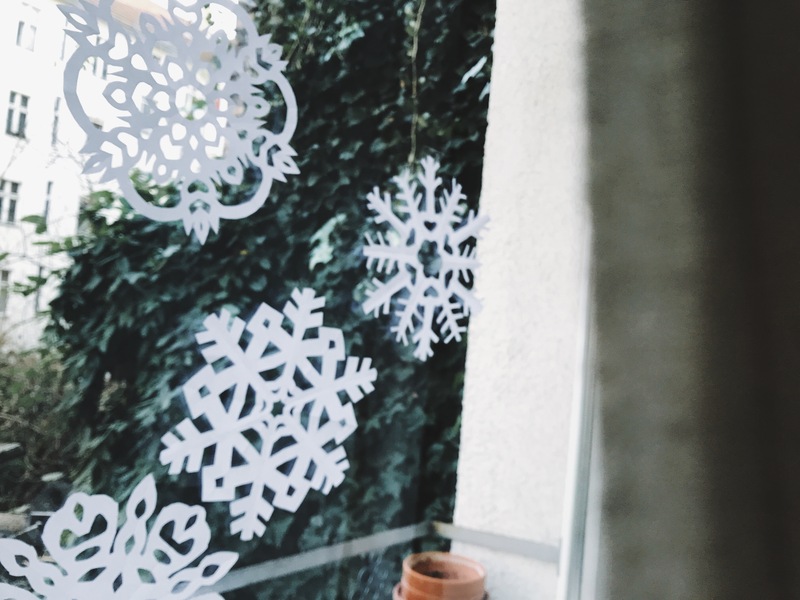 Then—and this is super important—tape all of your paper snowflakes to the windows of your house, because my daughter is convinced that this brings winter snow. Berlin never gets enough snow! My children are desperate! So, especially if you live in northern Germany, help us out with this bit of magical thinking. 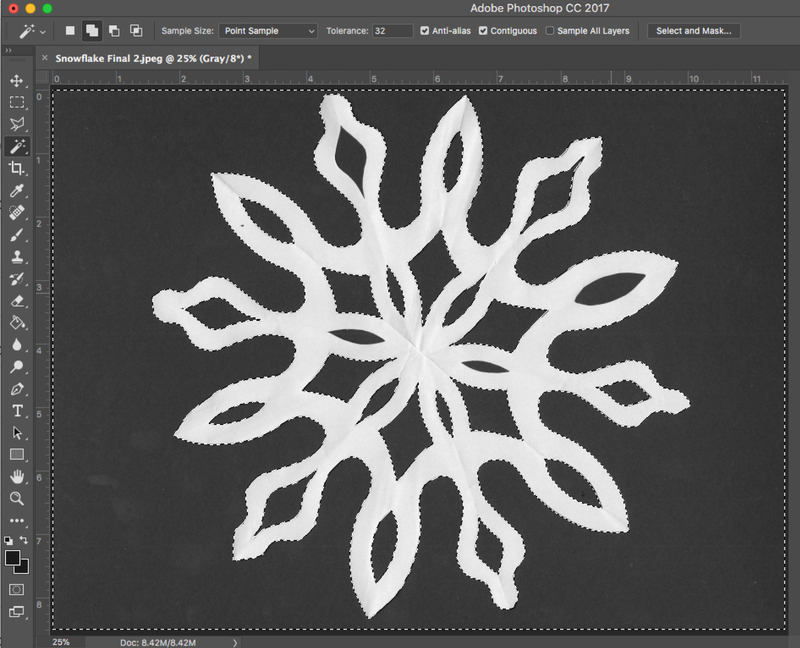 Then, open the individual snowflake files in Photoshop. 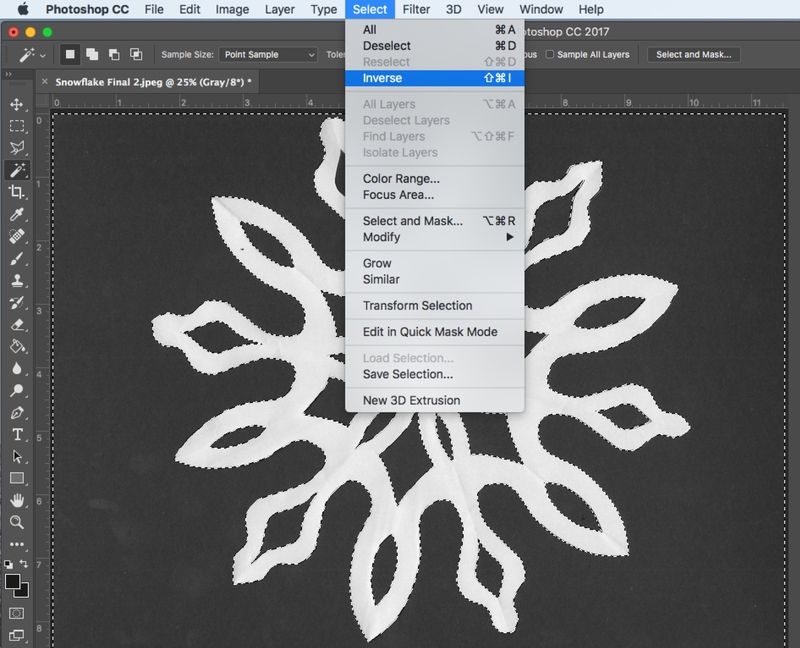 Tip: I liked to see the folds in my snowflake in the final file. 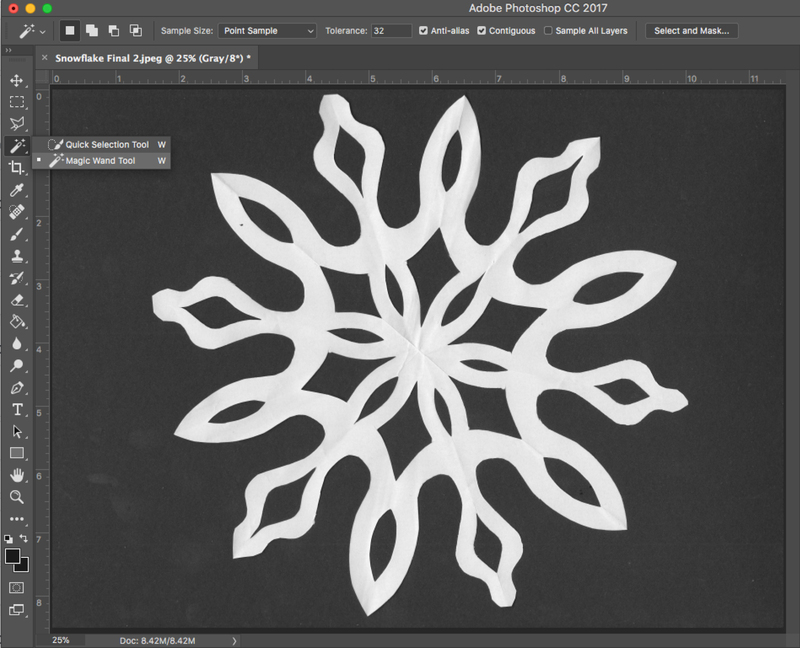 But to get a perfectly white snowflake without visible folds (and a perfectly solid-black background, too) go to Image > Adjustment > Threshold and set it to 128. This will give you a perfectly black-and-white image without any grey. Using the Magic Wand Tool set at tolerance 32, click all the black areas around and inside the snowflake while holding down the Shift key. This allows you to select several unconnected areas at once. When every bit of black is selected, choose Inverse from the Selection drop-down — this selects the snowflake without any background. 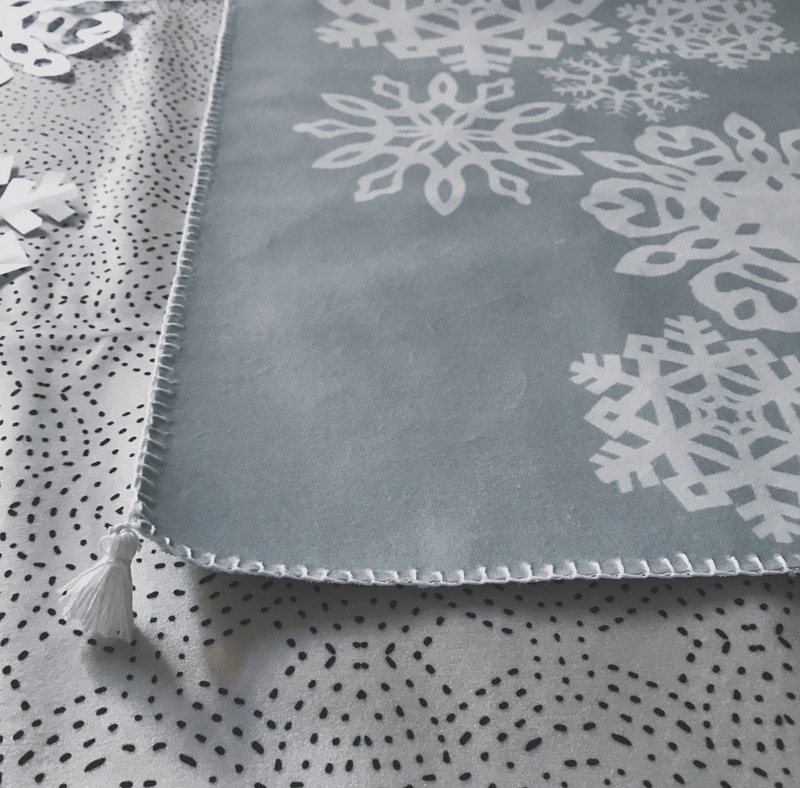 With the snowflake selected, copy it to your clipboard, then go to your table runner file. Paste the snowflake into it. You can then use various Transform options under the Edit drop-down menu to Scale or Rotate the snowflake however you desire. 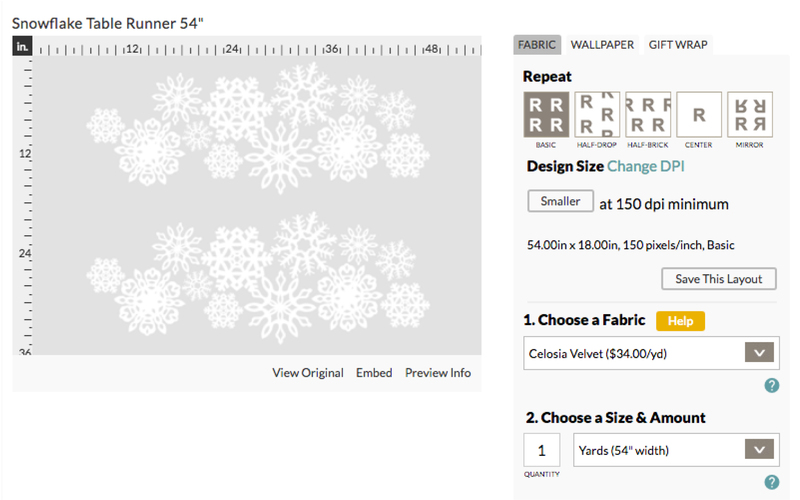 Save your file as a .jpg and upload to Spoonflower, then choose Celosia Velvet and order one yard. Your design will repeat twice — one for the front and one for the back of the runner. 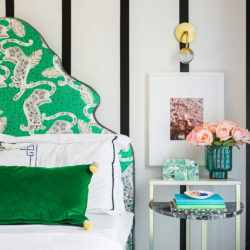 You could also order another yard of a different back fabric to create contrast, for days when you feel like a different design, or for when somebody inevitably spills wine all over it one evening. I used the same design printed on Linen Cotton Canvas for the back side of mine. When your fabric arrives, open up the box and scream a little with delight, and then cut the fabric two 54″ x 18″ rectangles. Cut very, very straight with a ruler and use a rotary cutter if you have one around, because we’re not going to hem the edges at all. Rather, I’m going to embroider a blanket stitch around the whole thing so the runner has a tiny bit of fraying after awhile, just enough to contrast nicely with the velvet. 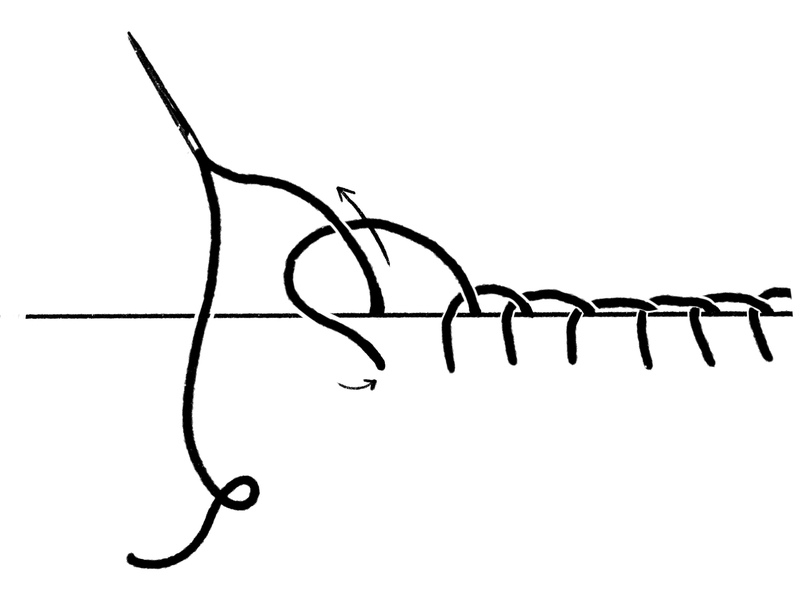 Place the rectangles wrong sides together and use the embroidery thread to blanket stitch around the entire thing. 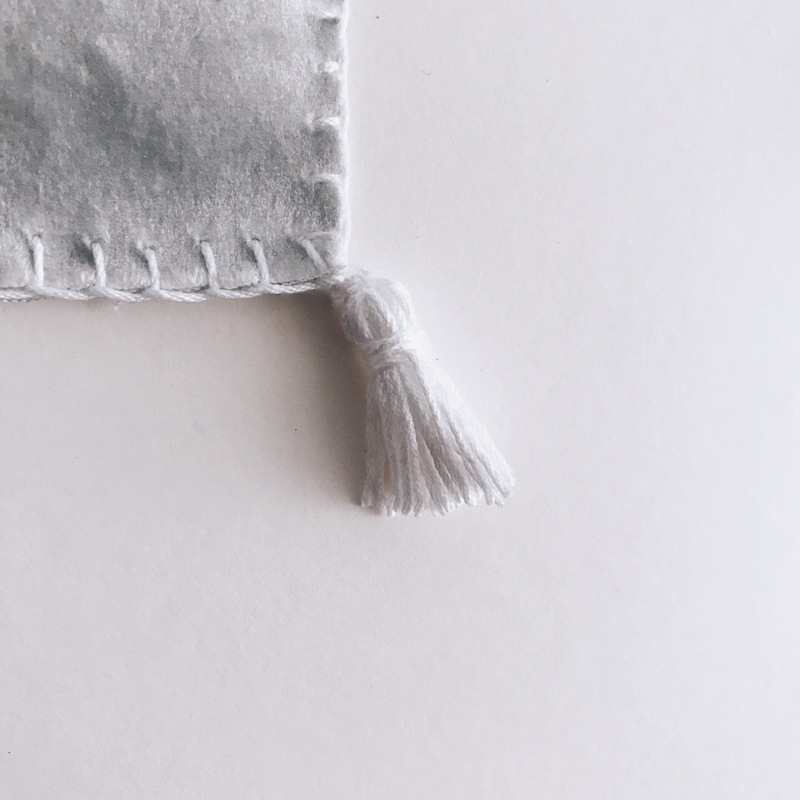 I am not an expert embroiderer so I stuck with the basic blanket stitch but if you are comfortable with a needle and thread, you may want to try something more complicated. 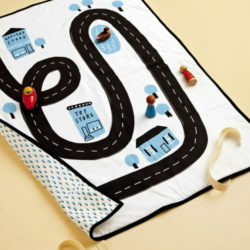 Use a blanket stitch to sew your fabric pieces together. Then, you just tie the tassel on to the the corners of the table runner. That’s it! 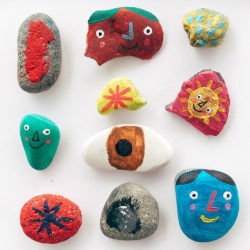 You’re ready for a handmade holiday. 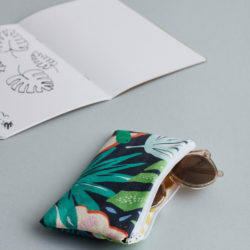 No time to create your own design? 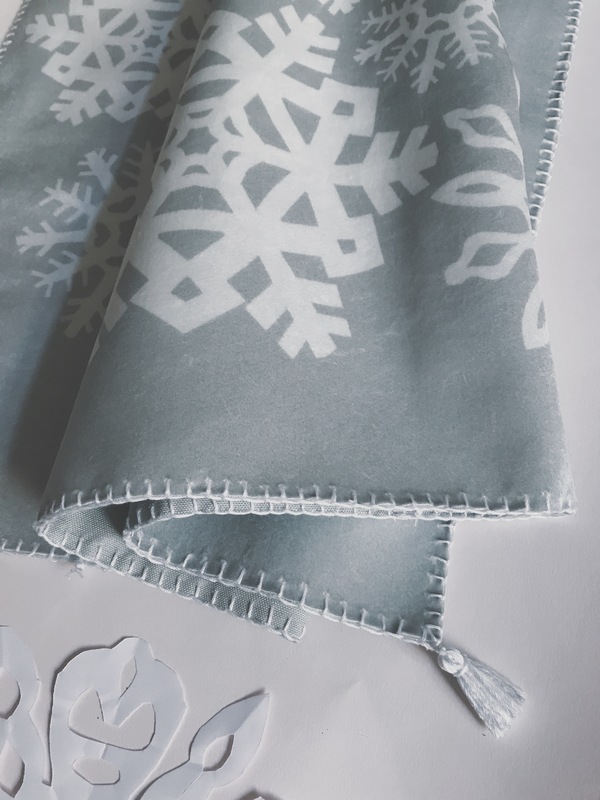 Take a closer look at Anda’s winter inspired designs for a head start on your DIY table runner!